Students from Sekolah Kebangsaan Kangkar Pulai joined the team at Pulai Springs Resort to celebrate the nation’s 59th National Day by painting a giant flag together. Following the success of its inaugural event last year, the resort recently organised the National Day activity dubbed Sehati Sejiwa, for the second time. Escorted by headmistress Rohani Samsudin and senior assistant Umi Kalthum Abu Bakar, 30 students aged 10 and 11 from Year 4 & 5 classes, were bursting with energy and enthusiasm, obviously thrilled to be part of the resort’s National Day celebration. While this was part of the resort’s Corporate Social Responsibility programme with the local community, the invitation for students to join the resort’s National Day event aims to promote the spirit of patriotism and love for the nation from a young age. The weather was bright and cheerful when the students were welcomed to the resort’s poolside and joined by members of the resort’s Sports & Welfare Club committee for the painting activity. Armed with painting tools like brushes, sponges and small cups filled with water, the students went about painting the giant flags with the help of the resort associates. Designed on a 50-ft length of fabric, a clear panel printed with the words, Malaysia – Sehati Sejiwa, separated the giant jalur gemilang and Johor flags. “This is the second time the resort is organising such an event and I’m glad to see how the students are enjoying themselves painting giant replicas of the national and state flags,” said Pulai Springs Resort general manager, Sunny Soo. “We want to encourage the spirit of patriotism among students and believe that this event will instill an awareness and promote pride in our nation,” he added. After they completed painting the national and state flags, the students were invited to select a choice of colour for their palms to add their palm prints next to the words, Malaysia – Sehati Sejiwa. There was much excitement as the students were joined by their headmistress, senior assistant, Soo and the resort associates to colour their palms to print onto the design. The students were treated to light refreshments from a delightful buffet spread and each presented with a goodie bag filled with snacks and a miniature jalur gemilang flag. When Soo observed how much the students enjoyed this activity, he promptly declared that the resort would make this an annual event! So when you are at the resort during this National Day season, look out for this giant Malaysia – Sehati Sejiwa flag design, proudly displayed in a prominent place. It was not too long ago when I held these babies in my arms and they grew up to be energetic kids and suddenly they are responsible individuals with lives of their own. I’m talking about my six nieces and nephews. Two in the UK, three in Australia and one in KL who would be joining the three in Perth, to further his studies, very soon. I’m not sure what brought on this sentiment but as time is passing real fast, I’m reminiscing on these young people. We are just four years to 2020 and then it will be the year 2525 – the stuff that some songwriter wrote about! It’s interesting that I go by several titles and will answer to each respectful title they use to address me. I’m aunty to our English niece and nephew, Ah Yee to my eldest sister’s boys and Kumaa to my younger brother’s children. It took me a while but I realise that this Cantonese tradition is rather useful to identify which nieces and nephews are from my sisters’ families or my brother’s family. I was brought up to address our uncles and aunts with titles like Aunty Polly and Aunty Sylvia or Uncle Billy and Uncle Arthur, and it was quite simple because my mother’s siblings have English names. I vividly recall that amusing situation when I discovered that I’m Ah Yee because it happened at my eldest sister’s wedding banquet held at her husband’s hometown. In the Chinese tradition, the bride and bridegroom’s family were seated together at the main table. Her Cantonese father-in-law was seated across the table and we were chatting in a convivial way – me searching for the vocabulary and struggling to conduct the entire conversation in Cantonese – because he did not speak English. He was rather traditional and my sister was to address him, “Low Yeh” while I’m told that I should follow her lead to address him as, “Chan-Kar Low Yeh.” It was quite a mouthful but I managed. In the course of conversation, he was saying the phrase, “Ah Yee” to me several times but I was so ignorant [even my mother did not prepare me for this!] that I thought he was talking to someone behind me. So I turned around to check for who was behind me – there was no one – and suddenly it dawned upon me that he was referring to me! I felt rather foolish but that was how I discovered that my official title was “Ah Yee,” the way my sister’s children should address me [when they came along] because I’m younger to her. Since then, I never looked back [pardon the pun!] and always answered to my official title with pride. I remember Jamie was just three months old when my sister, Pearly and her husband brought him from the UK to meet the family in Malaysia. He was just a tiny baby but he did very well on such a long journey at such a tender age. He was the first of our parents’ grandchildren and we had fun introducing him to all the relatives here. Since that first trip, he and his sister, Melanie, have made numerous visits to Johor and I particularly enjoyed our time together when they came to spend about four weeks with us – without their parents. Melanie – our English niece – decided to volunteer at an elephant sanctuary in Sri Lanka for a month and planned to come to Malaysia after that stint. She planned with Jamie to join us from the UK and we had an eventful itinerary together, visiting relatives and doing the touristy thing at various places of interest. From touring the Petronas Twin Towers to white-water rafting in the chilling waters of the Gopeng River, we made many special memories together. We also had fun with them when we holidayed in the UK and I treasure the pleasure of spending time with our English family, going on invigorating walks on Chinnor Hills, browsing for books and knick-knacks at charity shops and indulging in English fare – from buttered crumpets, pies and puddings to my favourite Walkers crisps! In 2014, we received a message from Jamie, asking us to save that date in August. It was a much anticipated event and in the summer of 2014, my siblings and I were in the UK again to witness Jamie’s wedding to his sweetheart, Kimberly. It was a joyous and memorable day – and rather cold too – but we were together for a lovely wedding celebration. One of my fondest memories of Andrew, the older of my eldest sister’s two sons, was when he approached me to ask for the meaning of the word, “enormous.” He probably discovered this word while watching shows in the Cartoon Network but I was both touched and amused that he was curious for the meaning of this word. I can never forget the pleasure of explaining its meaning in simple language to such a young child. Another unforgettable experience with Andrew and his brother, Aaron, was when my sister was suddenly taken ill and her husband rushed her to hospital. They could not leave their young boys alone at home so Ah Yee came to stay with them. While I was with the boys, there were a crucial few hours at the hospital, waiting for the doctor to examine and diagnose my sister. A feeling of dread and uncertainty prevailed because the boys saw their mother in great pain and discomfort for the very first time. Instead of trying to distract the boys with something, I spent time talking through the whole incident with them. It was simply therapeutic to talk about it and listen to their comments so that I could reassure them that the doctors would do everything necessary to help their mother get well. I can still picture their innocent, young faces when I encouraged them to talk about it. They were both clearly shocked to see their mother in pain and I was too but I remember their courage when I asked them to pray with me for their mother. Their childlike words and sentences simply wrung my heart out as we talked to God about our concerns and asked for His healing hands to touch my sister. My sister was admitted and when my brother-in-law came home, I went to the hospital where I stayed overnight to accompany her. By God’s grace, my sister made a full recovery and this sudden illness never recurred again. Well, if there was a child who was openly affectionate, it must be Aaron. He was on the plump side and I used to brace myself whenever we met because he had a habit of giving me a running-jumping hug! Meeting him was like…Oof!...getting the wind knocked out of me! Every time he came at me with his flying hug I thought he was going to pluck off my earlobes (bleeding from my dangling ear-rings!) and give me a few cracked ribs… but I’m grateful that I lived to share this fond memory. While Andrew and Aaron furthered their studies in Perth and found work there, we remain in touch with the help of modern technology. I had fun exploring Perth when I visited them several times. I’m truly blessed to have a relationship with these boys from young and thanks to regular group chats and frequent Facetime conversations, it has kept our bonds close. Last year I was with Andrew and his family on a visit to Cape Town, South Africa and this year, I was on a trip to Delhi-Jaipur-Agra in India with Aaron and his fiancée. Spending time with them on holiday showed me another side of these young men and how they have grown to become individuals that their parents are mighty proud of. Finally there’s Amanda and Brendon, who spent a great deal of their early years with me because I used to ferry them back from school. When we saw these pint-size kids and considered the long hours they had to spend commuting on a school-bus, I volunteered to drive them. So I planned my schedule around their pick-up times and did the routine of waiting with other parents and guardians outside two different schools. My car was a familiar sight, first outside the primary school and then outside the secondary school for a total of 11 years – waiting to pick up Amanda. In her secondary years she had tuition, music and extra-curricular activities or extra classes and when she sometimes forgot to tell me, I would be waiting endlessly – watching girls leave without any sign of her and it worried me if something had happened. Apart from sometimes failing to inform me about changes in pick-up times and causing panic, she was a responsible student who took her studies seriously. I remember how she laughed when she discovered that I’m quite a dud in Maths because doing well in Mathematics and Additional Mathematics just came naturally to her! Growing up in an English-speaking environment, Amanda enjoyed the language and also did well in this subject. Very often she would show me her English class work and test papers to ask me about the answers that her teacher insisted was correct. I would then explain the context of the sentence or scenario to her – to give reasons why the teacher reached that conclusion. Sometimes I would agree that there was something wrong with the answer and gave her alternative answers to show her teacher. While it was unkind to be tickled by their atrocious command of the language, it just saddened me that the standard of English in secondary school was simply shocking. When Brendon’s school friends saw my car coming to pick him, they would shout in chorus, “Brendon, your mummy is here!” and I remember how Brendon would yell in reply, “She’s not my mummy!” Which is true because I’m his aunt and only a part-time mummy. Every time when Brendon hopped into the car, I would gauge his mood and respond accordingly if he felt like chatting about his day at school or not. Sometimes he was tired and quiet but sometimes he would regale me with tales of the day’s happenings. Then he told me about how a bully was doing terrible things at home and at school. One incident that remains engraved in my memory must be when Brendon became a victim of this school bully. That day, Brendon came into my car sobbing. When I saw it, my maternal instincts went on high alert. I coaxed him to tell me why and when I heard what that bully did to him, I told him to wait in the car while I went to speak to the teachers. When I reached the office to ask for the teacher-in-charge and the whereabouts of that bully boy, a group of Brendon’s friends was trailing me, obviously eager to help. When the office staff was unsure of where these people were, the boys were quick to volunteer the information, saying they knew where and quickly led me there. These boys claimed they witnessed what the bully did to Brendon and when I met the boy, I reasoned with him and his guardian and urged him never to do that again. This boy had picked on others like Brendon who was well brought up, never to retaliate with violence. From what I already heard about him, I know the poor boy was from a broken home and was probably doing silly things to get attention so I also had few choice words with his guardian. I then asked the bully to apologise to Brendon and he did. Since that incident, the sight of Brendon’s aunty struck fear in would-be bullies because they knew that if anyone ever touched Brendon, they would have to answer to his fiercely protective Kumaa! Speaking of Kumaa, the Cantonese title for aunty that my younger brother’s children use to address me, we often have a laugh because this word sounds similar to the Indian name, Kumar. So when non-Cantonese speaking people heard the children calling me, “Kumaa” they often wonder if there is an Indian in the family! Time is passing fast. In a few months’ time, all my nieces and nephews would have flown their nests to start new chapters of their lives away from home. This is an exciting turning point for the parents as they adjust to the changes in their proverbial empty nests. Meanwhile this aunty is still here, wishing them well and sharing the pride in seeing them grow strong feathers to fly and soar to their greatest heights of achievements. I had the opportunity to go behind the scenes to see how the SIGS Marching Band was preparing for their next challenge and shared their story in, The band plays on [NST Life & Times 12 July 2016]. Fresh from the World Championship Marching Show Bands competition held in Putrajaya from August 3 to 6, drum majorette, Nur Emilia Huda Mohd Yunos, 17, gave me the update that even though they did not emerge as champions, they clinched the Gold award. While they performed very well, the band realized that other performing bands were also very good. It was indeed a tough competition for Johor’s SIGS all-girls marching band, one of three schools that represented Malaysia in this international competition with up to 20 participating nations – and yet they achieved Gold! The band deeply appreciates the opportunity to participate in such a world-class event as it was also good exposure for them to learn from others and make the necessary improvements. Speaking on behalf of the band and the SIGS Band Club, Nur Emila would like to thank everyone who supported them in boosting their morale and in practical ways. The band wishes to say a BIG Thank You to all of you who supported them in every way! Now it’s back to work again, training and keeping abreast with the latest marching show band trends under the watchful eyes of band instructor, Harisman Nasrun. Visitors to Jalan Tan Hiok Nee at Johor Baru’s heritage quarter, simply fall in love with the charm of Hiap Joo Bakery & Biscuit Factory, a business run by a family of traditional bakers. When Hainanese baker, Lim Joo Ban, started this bakery using a wood-fired wall oven back in 1919, he baked loaves and a range of filled sweet and savoury buns as well as banana cakes. Old-timers may recall how Lim would sit on a rattan chair outside his narrow shop front in the evening to cool off after toiling in the bakery. Before the era of bread factories, this was the preferred bakery of bread-lovers in Johor Baru and many did not mind driving all the way downtown to pick up a loaf or two. In those days when traffic was still smooth even in the heart of town, regulars could do a drive-through to buy their choice of breads from Hiap Joo Bakery. They would call out their bread order to the friendly baker, usually seated on his rattan chair outside and he would send the bread and collect his payment – all done through the car’s open window! Lim passed the legacy of this traditional bakery to his son, Lim Meng Chin, who picked up the skills in baking using a wood-fired oven by working alongside his father. In the same way, Meng Chin’s son, Lim Toh Shian, better known as James, worked with his father to master the unique skills in baking a range of products using this traditional oven. Now, the second and third generation Lims operate the business with very few changes since the days of grandfather Lim. The façade and the shopfloor of this quaint little bakery remains virtually unchanged since its early days. You may even spot the rattan chair that grandfather Lim used to sit on when he cooled off in front of this bakery. A closer look at the wall oven reveals that there is no mechanism like a thermostat for the bakers to accurately guage the temperature. When asked how they knew if the temperature was just right, the bakers say that it’s a matter of applying their experience! A peek through the open window shows a cavernous oven heated by smoldering wooden sticks inserted through small wall openings, with glowing embers that line the oven’s inner walls. It’s fascinating how the bakers have honed their skills to gauge the temperature without the aid of technology. Dough was mostly kneaded by hand with minimal automation but with the invention of better mixers, James found that the use of a modern mixer yielded softer breads and cakes. Now the next generation Lims continue to bake sweet and savoury-filled buns and light banana cake using the same recipes with slight modifications to the method of preparation. With increasing demand, it’s become necessary to use some automation in the preparation process. A steady supply of recycled wood from old pallets for fuel, keeps the wood-fired oven going. A random survey of customer preferences indicated that while the range of filled buns remain popular, their freshly baked banana cakes are still a hot favourite. And to keep customers happy, Hiap Joo even adjusted their baking schedule to meet the increasing demand for their breads and cakes. Breads should come out of the oven by 11am while they strive to keep banana cakes available throughout the day. Sometimes the crowd at Hiap Joo can be overwhelming so don’t be surprised to see a long queue waiting for the next batch to come out of the oven. Don't be disappointed when you read this. Patience certainly pays off as the team in Hiap Joo, made up mostly of family members, have a well-oiled system of receiving freshly baked trays straight out of the oven, cutting and filling hygienically packed boxes with the piping hot cakes for waiting customers. Sometimes customers arrive when stocks have just run out. While it may be disappointing to hear the bakers saying, “Sudah habis!” fans of Hiap Joo are a good-natured lot who know how to deal with it. They may come back later or on another day because they know that the faithful old oven will be baking a fresh batch again, just as it did since 1919. Hiap Joo Bakery is at No. 13, Jalan Tan Hiok Nee, Johor Baru. Open daily 7.30am to 5.30pm, and closed on Sunday. 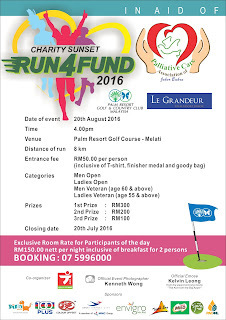 Do you have what it takes to run 8km in Palm Resort’s Sunset Charity Run4Fund? The success of the inaugural Run4Fund jointly organized with TJ Mart Kulai to raise funds for the Palliative Care Association (PCA) of Johor Baru last November has prompted the organisers to follow-up with the second charity fun run planned for Saturday, August 20. This is a run with a difference. Palm Resort Golf & Country Club has designed an 8-km golf course route on the Melati course, one of their three challenging 18-hole golf courses, to welcome non-golfers to enjoy the scenery at the course. The organisers realised that a route within the golf course will not only give non-golfer participants the opportunity to have first-hand experience of a golf course but also to run in a safe environment which is free from vehicular traffic. The flag-off at 4pm will give participants the opportunity to enjoy a sunset view of lush tropical greenery sprawled across manicured hills and interspersed with water features like ponds and streams. The charity run invites participants to join in two Open categories for Ladies and Men and two Veteran categories for Ladies (aged 55 and above) and Men (aged 60 and above). Cash prizes of RM300, RM200, and RM100 will be awarded to the top three runners. 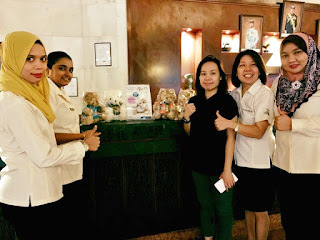 One of the event sponsors, Dinowork, is helping to raise more funds by selling souvenir teddy bears at RM50 each with the sum of RM20 contributed to Run4Fund. Club CEO and Hotel General Manager of Palm Resort Berhad, Jef Kong, explained that the cash prizes are just a token sum because they want to channel the bulk of the funds to support the Palliative Care Association for their work with needy families. In 1995, the Rotary Club of Johor Baru pioneered the setting up of the first hospice in JB to provide care to terminally ill cancer patients and the service evolved into an association dedicated to providing palliative care. Palliative care is a medical specialty in providing comprehensive and compassionate care to help terminally ill patients have a better quality of life while respecting their right to live out their remaining days with dignity. Since its inception in 2007, the Palliative Care Association of JB has been giving essential support free-of-charge to terminally ill patients and their families. The total cost for providing free service to patients is estimated at about RM325,000 per annum. Registration fees for the charity run at RM50 each entitles participants to an event T-shirt, finisher medals and a goody bag. So if you haven’t done so, register now to run for a good cause! Participants may also enjoy an exclusive room rate at Le Grandeur Palm Resort on the event day at only RM150 nett per night inclusive of breakfast for two. He was just 13 when Yap HanZhen held his first solo art exhibition in 2011. It showcased a collection of 46 pencil sketches of dogs, cats and butterflies and was called, Of Obedience, Solitude and Beauty. These days, HanZhen, 17, is showcasing more challenging pieces. A collection of his sketches of heritage buildings in Kuching, titled Kuching – Legacy of the White Rajahs, was recently published in a project initiated and supported by the Malaysian Institute of Architects, Sarawak chapter. Dogs & Puppies – My Pet, My Best Friend, a series of sketches on companion animals, is the latest compilation of his published sketches. It was during his first solo outing that I met this young artist who, together with his parents and younger brother, ZhiHan, helped visitors select their purchases. The profits, I was told, would be channeled to the Kiwanis Careheart Centre. The two brothers looked very striking, clad in T-shirts printed with a sketch of The Butterfly which I later learnt, was reproduced from HanZhen’s favourite early sketch. A chat with his parents revealed that HanZhen, a savant autistic teenager, was diagnosed with autism at age 2. In order to communicate with him, his architect parents, Yap Yew Peng and Yvonne, devised a method to help him develop his vocabulary. As architects, they often sketched thoughts and ideas using paper and pencil. To teach their son, they adopted the same method, drawing objects and writing the descriptions for him. Yvonne said they even drew expressions like happy or sad as well as actions such as sleep, walk and eat, to help him learn these concepts. As his parents taught him the names of things to increase his vocabulary for speech, they discovered HanZhen could draw. When he realized that it was a fun learning process, HanZhen started drawing items around the house – from a cup to a table or a tree. His parents encouraged him to draw objects and to pair them with words. Smiling in recollection, Yvonne says that HanZhen would draw everything he saw, from everyday items at home to things he experienced on holiday, often with great detail and accuracy. Soon she had to admit that his sketches looked much better than her own. They were thrilled that he could draw all the things at home and was able to accurately label his pictures. Gradually, his vocabulary, speech and reading skills improved but it was his sketching skills that took their breath away! Recognising his special gift in drawing, his parents bought him sketch books that HanZhen could carry around to sketch. On holidays, their son would sketch pictures of people, places and things. 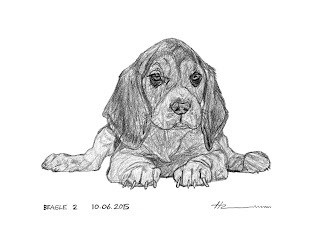 He may doodle a quick sketch in just three minutes or take a week to create a masterpiece. The young artist, a right-hander, usually draws from left to right. It’s amazing how he would start to draw an image from the top to the bottom or from the bottom to the top but either way, his sketches would all be completed in the right proportions! Today, HanZhen attends a local mainstream international school which supports the development of art. While his sketches seemed like childish doodles when he was younger, his drawing skills gradually developed over time. 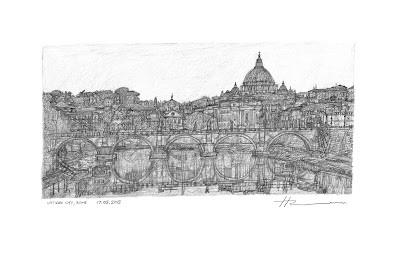 When he started sketching as a hobby in 2009, he spent almost two hours drawing every day after school. With a daily routine in drawing, he filled up dozens of sketch books with fascinating images. His mother recalls that her son was just 6 when he drew a sketch of the solar system and called it, Balloons. She was fascinated to discover that after he filled up one side of the sheet of paper, he just continued his drawing of the planets on its reverse page! In December 2011, this prolific young artist embarked on a project to sketch flora and fauna in mangrove forests. Thirty of his sketches were published in a book, River Biodiversity in late 2012. This collection of sketches was displayed in the Senibong Cove clubhouse to compliment the waterfront residential development’s mangrove regeneration programme. Things got better for the youngster when he was subsequently encouraged to sketch images of Johor Baru’s iconic heritage buildings. 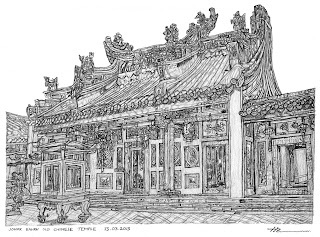 With a keen eye on building architecture, his parents agreed that HanZhen’s sketches would be an excellent way to preserve their architectural beauty for posterity. Since showcasing his art in a show titled, Of Routine, Memory and Details at the 2011 Kiwanis charity dinner, HanZhen continued selling his art and donating the proceeds to charity. When the family visited Xiaozhou Art Village in Guangzhou in 2011, HanZhen was inspired by the artistic community there and sketched a series of gateways in ancient and modern China. 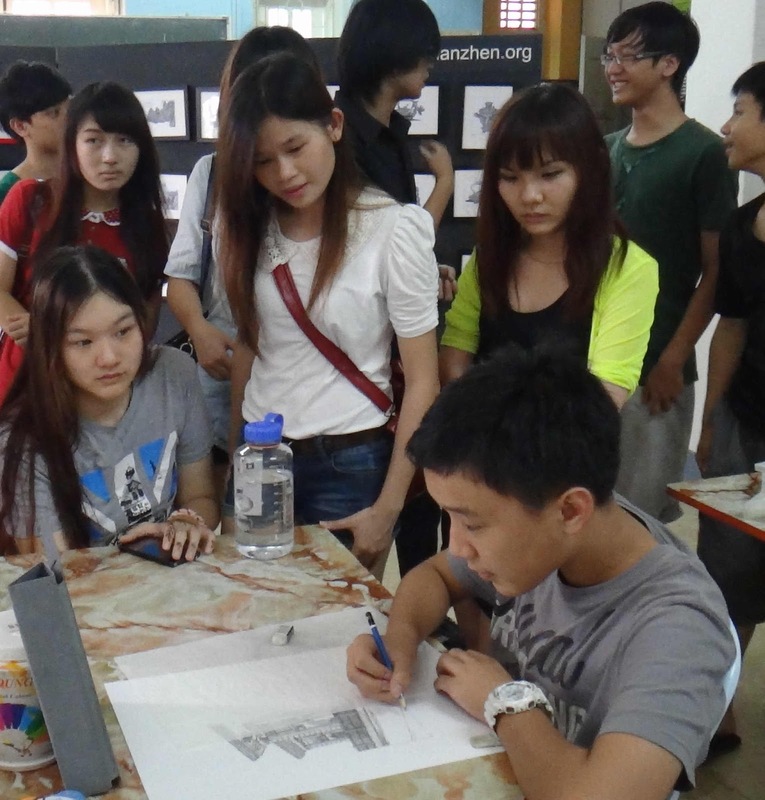 Twenty pieces of his fine sketches of centuries-old Xiaozhou gateways were exhibited at a Malaysian Institute of Architects event as a tribute to architectural heritage and autism art for World Architecture Day 2012. This exhibition then moved to the main lobby of Landmark Towers, JB. It was in April 2012 when I crossed paths with HanZhen again. It was at his school’s fund-raising fair where 12 of his sketches of tigers and the entire collection of T-shirts printed with The Butterfly, were sold out and all proceeds contributed to the school fund. 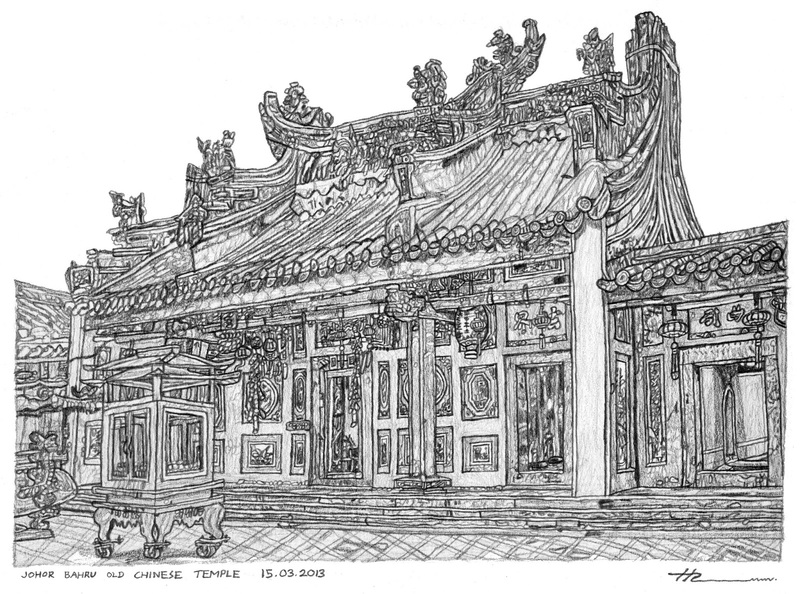 HanZhen was greatly motivated when his sketch of the historical Cheng Hoon Teng Temple in Malacca was among the winning entries from 1000 entries in the Asia Para Art 2013 competition in Japan. His success earned him a special invitation to Asia Para Art 2013 held in Tokyo in October 2013 and a spot in a travelling exhibition to various airport locations in Japan. Later his sketch of Meiji Jingu, a shrine in Shibuya, Tokyo, was exhibited at the Japan Tottori ParaArt Exhibition 2014, an international art show held at Tottori Prefecture Art Space Gallery. When the DoubleTree by Hilton Hotel Johor Baru opened in July 2014, the walls of its lobby, lounge and restaurants were adorned by 101 pieces of HanZhen’s commissioned work. Meanwhile, 30 of his sketches of the city’s iconic buildings were compiled into a book, My City, My Heritage, to document JB’s building heritage. It was used as a guide for tourists to enjoy a walking trail to locate these interesting sights. So impressed was the Consul-General of Singapore in JB with the boy’s talent that he commissioned the young artist to do a sketch of the view of the JB skyline and causeway. As HanZhen worked on this project, his parents realised that their son’s art had taken a leap. 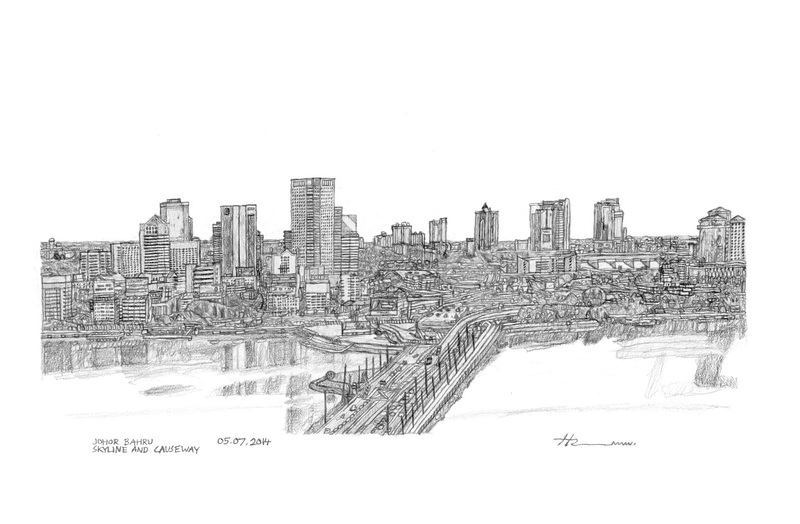 He was no longer just sketching single buildings, he was now answering to the challenge of drawing a collection of buildings in the panoramic JB skyline and causeway. The original is displayed in the Singapore Consular office in JB while prints were reproduced to present as premium items to their visitors. A good-natured teenager, HanZhen also enjoys playing the piano. He started music lessons at age 6 and successfully completed his ABRSM grade 8 exams. Blessed with a photographic memory, he would read the score once and was able to play the music from memory! His supportive parents understand that HanZhen sees the world differently and have created a nurturing environment for him to excel. To date HanZhen has held 39 exhibitions in JB, Malacca, Kuala Lumpur, Kuching, Singapore, Korea, Japan and China. Having been featured in the media, both locally and abroad, HanZhen is truly an inspiration to parents of children with disability who can likewise, motivate their children to excel in the field of their choice. So what’s next? His parents are not saying much but it might be something to do with a mural. Hanzhen was among Malaysian artists who participated in creating murals to commemorate Shell's 125th Anniversary, celebrated on August 4. It was our first visit to Laman Mahkota since it was opened to the public in 2014. And yes, we did feel like tourists among the throng of visitors, mostly armed with phone cameras and selfie-sticks to capture photo mementoes of this much-photographed view. My brother and his family, visiting from Kuala Lumpur, decided to do this touristy thing, probably to renew his bond with his hometown and share their pride of being true-blue Anak Johor with others! Laman Mahkota, the site of the crown arch with a bank of fountains and adjacent carpark, was presented by the Johor Sultan as a gift to the rakyat, to enjoy a relaxing park-like ambience outside his official residence. The giant replica of the Johor ruler’s crown, that weighs several tons, rests on top of arches that resemble elephant tusks. Close-up, we could see the “gems” that decorate the crown lit up in a glittering glow against the night sky. Istana Bukit Serene may not be Buckingham Place but there was a prevailing sense of pride among the rakyat mingling here. Groups or individuals politely took their turns to pose for photos – Malay, Chinese, Indian and foreigners – everyone just enjoyed the evening outdoors cooled by balmy breezes, a welcome relieve in the humid heat. Visitors clearly appreciate the Johor ruler and wish to get a glimpse of the palace – and even the opportunity to meet members of the royal family – if the happened to pass through the gates! In the evening, Laman Mahkota was certainly a pleasant place to hang out with the family or with your date. We saw groups and couples posing and taking we-fies together and were rather amused when a couple asked for a favour to help snap a shot of them! It was an opportunity for my nephew, Brendon, to practice his photography skills and I must say he did quite well with back-lighting a we-fie of ourselves taken in the semi-darkness! The footpath from the carpark to the fountains is paved but across the road, the access to the fountain area is too narrow for the daily volume of visitors and not user friendly to the elderly and wheelchair-bound. This resulted in “human traffic congestion” and caused impatient people to carve out their own paths by the sides of the steps. In the long term, this area is going to deteriorate and become ugly. This is also a good site for the public to be educated in civic consciousness like keeping the place clean for everyone to enjoy. There should be better enforcement of penalties for littering so that people will be compelled to use the dustbins provided. If the volume of trash increases, this is a good place to station recycle bins and educate the public to put the various types of rubbish in the appropriate bins. I cannot help but make these observations because public spaces such as this must be preserved in the long term, by the public’s commitment to a positive attitude. It would certainly take a concerted effort to maintain Laman Mahkota as a destination that welcomes both hometown tourists as well as foreign guests and lets everyone leave with a positive impression of Johor and the pride of our royal family.